VINTAGE ROCK celebrates a time when music really did change the world - 45s, youth culture and the odd thrusting pelvis. Followed by £30.00 every 12 months by direct debit. We chronicle all the stellar artists and music, the enduring legacy of those early pioneers - and why it's still the best way to live.Spanning the dawn of the 50s to early Beatles. Spanning the dawn of the 50s to early Beatles (pre Eastern mysticism! ), Vintage Rock covers a time of Mods and Rockers, crinoline skirts and blue jeans, rock star movies and screaming-girl concerts. 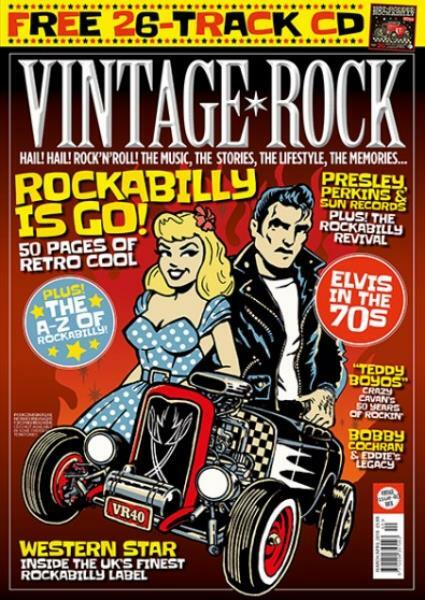 This special magazine rejoices in the music and verve of Elvis, The Shadows, Buddy Holly, Chuck Berry, Gene Vincent and a host more, and speaks to a contemporary audience that relishes the vitality and flair of the era. Subscribe to Vintage Rock magazine today.